Lex has been obsessed with the Dark Lord of the Sith since the Superbowl Commercial last year. We have spent the last year either having to play the Imperial March or hearing Lex sing it pretty much daily for hours on end. The “Darth Vader Song” is his most played track on his iPhone. We picked him up the costume about a month ago and we knew he would wear it out if he had access to it. He did remember all the pieces it included. My father also managed to dig out my brothers old full helmet mask. This helmet includes a voice changer and separate buttons that can do Darth Vader quotes. It is so much better than the current one they have out in the stores. The current one is a half mask that doesn’t cover your whole head. Thankfully my father managed to find that helmet, I actually have an identical one, but it’s still in the box. I would have opened it …….. but now I don’t have to. We wanted to dress up in costumes to compliment his. First choice of course would be Storm Troopers, but for the money and quality you get the only choice was the Supreme Edition Storm Trooper Costume. As much as Xie and I would both love to own our own sets, we could justify spending around 1500.00 for two of these outfits. So that was out. We ended up buying two Darth Maul costumes and added in the Deluxe Sith robes. For the overall look it worked pretty good. So we had Darth Vader and two generic Sith Lords to walk him around. In the end it was good we didn’t do the Storm Trooper costumes, parents were not allowed to cover their faces in costume at the zoo. Saturday we went as a family to “Boo at the Zoo” in Columbus. This was really Lex’s only opportunity to trick or treat because tonight is too late to go out somewhere and drive. Our town actually (for some illogical reason we didn’t realize until it was almost over) had trick or treat last Thursday. Let’s look at that for a second. Why the heck would you have it on Thursday October 27th? I read online it was going to be the 28th and that makes a little more sense. Weekends and Friday nights make sense. October 31st makes sense. Thursday October 27th makes no sense. Lex had his costume and was excited for his first Halloween experience. So we found out he could wear his costume and trick or treat at a place he loves, we jumped on it. Like all families we did attempt to get out of the house earlier in the morning. Like most families this didn’t turn out to be the case. We did rush out fast enough that we had to feed Lex breakfast on the road. We stopped at the Waffle House at the I-71 Delaware exit. While it isn’t the first Waffle House I’ve been in, it actually is the first I have eaten at. This one (other than the effect they accept credit cards) seems to be trapped in 1977. The food was ok, but it was a grungy time warped experience. At around 3 we finally made it to the Zoo. We all got dressed in the car. The reason I mentioned that Lex knew what was in the costume (even though he had only tried it on once) was the belt. At first we thought we forgot the belt. He noticed this immediately. After digging we discovered we did have it. Thankfully avoiding the meltdown of Lex noticing the costume was not “correct”. This was his Shakespearean acting, and nothing was going to be wrong with it. Just walking in we started to get strange looks. There was very few parents that dressed up to take their kids out. We purchased our tickets and walked in getting all sorts of looks. It wasn’t supposed to rain, but it did for about 15 minutes. Every time we go to the zoo somehow it rains, not matter what the forecast is. Thankfully this was short unlike the Noah worthy rain from the last time we went to the Cleveland Zoo. As soon as the rain ended Lex didn’t want to ride in the stroller. He insisted that Darth Vader walked. He received a ton of compliments. Some people thought he was dressed as the kid in the Super Bowl commercial. 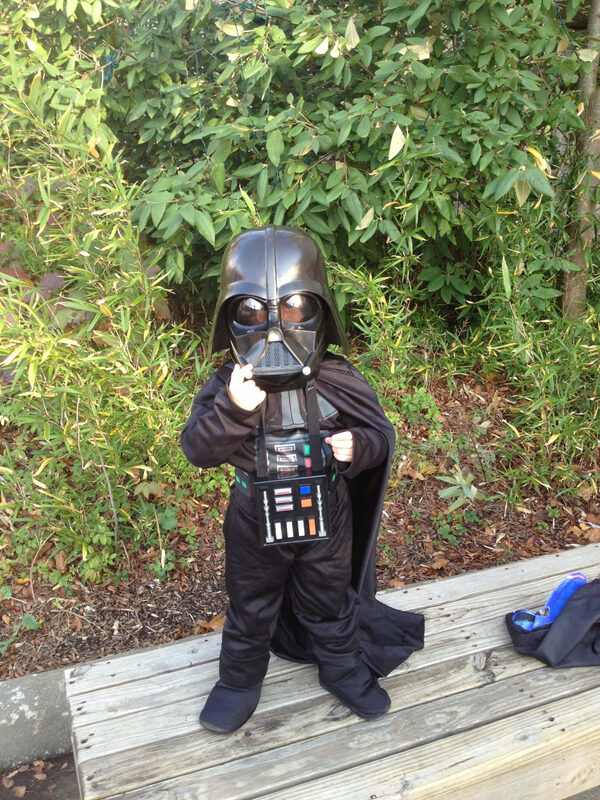 Unfortunately you can’t make a 2-year-old look too intimidating, even in a Vader mask. After the first stop to keep the magic alive and add to the persona I started playing the Imperial March on my iPhone and just let loop over and over. Through out the day (according to play count) we heard the song 52 times. That means for over 2.5 hours that was pretty much the only music I heard. Lex did however pretty much march in step with the music. It was a long day. We kept asking if he wanted to remove the mask, because with the whole thing and the voice changer it was pretty heavy for someone his age. He however insisted on constantly wearing it while walking around. He even got upset when he had to remove it to take a drink. We brought the lighter front only Vader mask that we thought he would want to switch to later, it was never worn. While looking at some of the animals he would remove his helmet. At the point he was willing to be picked up to get a better view. Picked up or not, his whole body language changed. He no longer was Darth Vader, he was Alexander. Then the mask went on and the process reversed. He is a natural actor that can get into the role. We all received compliments (Lex the most) and everyone thought it was great. There were also other Vader’s there, but none had the full helmet except for Lex. Geek packratting for the win. Though he didn’t get as much candy as he could have traditional trick or treating (we did supplement his candy after the fact), I don’t think he could have had a better time for Halloween. You don’t KNOW the power of the cute side!!! I have that helmet too. It sits on my primary computer desk and every once in awhile I take it down throw it on and pretend that asteroids are of no concern to me. Great job at being a Dad there dad-io.